Earl of Ashburnham, 30 Dover Street, London. O.V. Watney, Cornbury Park, Oxfordshire, England; (+) Christie's, London, June 23, 1967, lot 17 (11,000 gns.=$32,000 to the present owner). V.J. Watney, A Catalogue of Pictures and Miniatures at Cornbury and 11 Berkeley Square, 1915, no. 64. A. Dubois de Groër, Corneille de la Haye dit Corneille de Lyon, 1996, p. 148, no. 37. London, Royal Academy, Old Masters, 1895, no. 173 as Clouet. London, Royal Academy, Winter Exhibition, 1908, no. 11. Although the Clouet family dominated French portraiture during the 16th century, Corneille de Lyon distinguished himself in the middle decades. Of Dutch ancestry and born in The Hague, he is first recorded as working in Lyon in 1540, before being naturalized French in 1547. 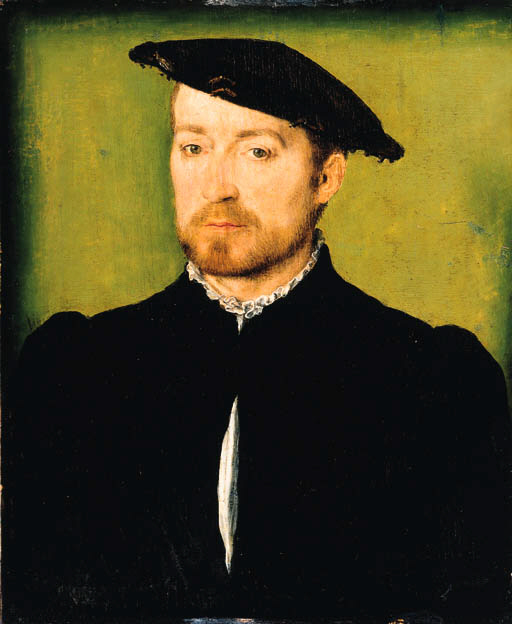 By 1551, Corneille de Lyon is identified as 'painter of the King' and that same year the Venetian ambassador described a visit to his studio: 'We paid a call on an excellent painter who, in addition to other fine paintings he let us see, showed us the whole court of France, both gentlemen and ladies, depicted with the utmost likeness on a great many small panels'. Eighteen years later following a wave of religious persecution, Corneille de Lyon abjured Protestantism and, with his family, joined the Catholic Church. He is last mentioned in the tax registries of Lyon in 1575, the probable year of his death. All of Corneille de Lyon's portraits are characterized by their small size, sensitive and naturalistic modeling in thin glazes which give each picture a variety of light and texture rather than plasticity, and by their plain green backgrounds. Focus falls almost entirely on the delicately painted face--hands rarely appear--and costume, even when it is luxurious, is usually summary. The present portrait is a typical, though especially refined, example of the artist's work. The sitter has traditionally been identified as Chancellor Henart, though no one with that exact name and title has been traced. Pere Anselme, in his Histoire Généalogique et Chronologique de la Maison Royale de France (1730) mentions a Jean Henard, treasurer of the Swiss Leagues, Secretary to the King, Payer of Wages for Parliament, and brother-in-law of Antoine du Bourg, Chancellor of France; and it is possible that there has been a confusion between the titles of the two brothers-in-law. Another possibility, suggested by Anne Dubois de Groër (op. cit.) in her recent catalogue raisonné, is that the portrait represents Jean Hannart, Viscomte de Lombeke, who was the ambassador of Charles V, the Holy Roman Emperor, to the King of France. Hannart went to Lyon in August 1536, and the portrait by Corneille probably dates from around this time.